GO TEAM 'BEE! 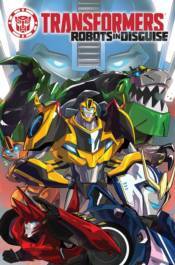 BUMBLEBEE leads an all-star team of AUTOBOTS to Earth to find rogue DECEPTICONS� but in this all-new story based on the hit Cartoon Network animated series, they're forced to go up against their old friend, ULTRA MAGNUS. What terrible secret can set AUTOBOT against AUTOBOT? !